Misty Whitford is a dental assistant at Langworthy Family Dental. Misty graduated from NICC’s Dental Assisting program in 2013 and joined our team shortly after. A bad experience at the dentist as a child prompted Misty to pursue a career as an assistant. She believes going to the dentist should be a positive experience, which is why she is committed to making patients experiences fun, enjoyable, and as comfortable as possible. 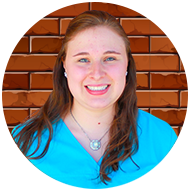 She enjoys working with patients of all ages, but takes particular interest in working with children! When not in the office, Misty enjoys spending time with family, especially her grandma, who she spends most Friday’s with. She also enjoys fourwheeling, snowmobiling, boating, baking, and hiking. Misty is a Mineral Point, WI native, but currently resides in Dubuque, IA.